Alcoholism is very different from other drinking problems or alcohol abuse. It's a disease which completely takes over a person's life. It's not something the alcoholic chooses, and stopping is not a case of saying no. It's compulsive and progressive disease, and until the alcoholic admits the problem and quits drinking, it's unstoppable. The condition affects their physical and mental health, and causes problems at home, at work and with friends. The term alcoholic is often used inaccurately, but the difference between someone who enjoys a few drinks and even sometimes a few too many, and the alcoholic, is clearly defined. It is not essentially just the person who had a heavy night and overdid things. It's a constant and overwhelming addiction. Also known as Alcohol Dependence Syndrome, alcoholism is classified in four ways; cravings, no control, physical reliance and capacity. Most of us at one time or another have thought how nice it would be to have a glass of wine, or a cool beer, but this is not what is meant by cravings. Craving, for the alcoholic, is a completely different matter. It's an overwhelming compulsion, a crushing need to consume alcohol that goes way beyond anything else, until the compulsion is satisfied and the alcoholic has a drink in their hands. They will move heaven and earth to get that drink, even stealing or lying to achieve it. Losing control in this sense doesn't mean getting so drunk you can't stand. It means being unable to stop drinking once its started. The alcoholic will find it almost impossible to enjoy normal, moderate drinking, and almost certainly be incapable of switching to drinking water or a soft drink when things start to get wobbly. They have no control over their alcoholic intake, and the main focus will be to keep drinking. Running out of alcohol is not an option, nor is stopping when there is drink to be drunk. Just like a drug addict, the alcoholic's body will become dependent on their intake, and the alcoholic will need to keep those alcohol levels topped up - often just to feel normal every day. Withdrawal symptoms include nausea, sweating, paranoia, shakiness, and anxiety and in some cases seizures and hallucinations can happen. In the most extreme cases, full blown delirium tremens - DTs as they're commonly known - can occur and the alcoholic can be very ill indeed. Usually, milder symptoms happen every day upon waking, such as anxiety, vomiting, shakiness etc, and this is only relieved by drinking more alcohol or by taking soothing drugs such as beta blockers or valium. As time goes by, the more alcohol you drink, the more you need to drink to get drunk. And aside from the physical dependence of drinking alcohol just to get through each day, the alcoholic is also seeking to get 'high'. As time goes by, more and more alcohol is needed to achieve that. The alcoholic is not fussy, and will drink whatever is around, whether it's fine wine or cheap cider. So you can see that alcoholism is not a simple case of drinking too much, it's far more complex. It's more important to them than eating, and will be more important than children and family, work, friends or even the alcoholic's own health and well-being. The alcoholic will often display many other drinking behavioural patterns, such as binge drinking, or using other drugs. But don't be confused; the alcoholic is at the mercy of a far greater drive to self-destruction. It may seem like self-indulgence to everyone else, but the alcoholic needs treatment for this condition the same as any other disease. A alcoholic doesn't need a excuse to drink !! Al come on! Your last comment really made you look uneducated. If I touch a cancer patient, someone with diabetes, etc. would I get that disease? yes some diseases spread by contact but not all and you clearly used cancer as a comparison to alcoholism. If I smoke cigs and get lung cancer... is that not a disease because I could have chose not to smoke. Yes, I too am an alcoholic and find this to be a very touchy subject. Not even sure of my own beliefs on it. One of the better movies I've watched on it is 'pleasures unwoven'. If your interested watch it sometime. I would like to hear your feedback. Regardless no addiction is as easy as a simple choice... best of luck to you and your recovery. I've recently started attending Al Anon - and immediately struggled with the disease model.A genetic predisposition makes sense to me - but ultimately I believe it's a mental health issue.My sister is a recovering alcoholic - but due to the underlying mental health issues, and highly likely trauma she experienced as a child/teen, she turned to alcohol to blot out the overwhelming emotions. The disease model is not based on solid research - and the AA who believe this is the 'truth' have a very high drop out rate in the first 12 months.That does not mean AA cannot/does not help many people - "horses for courses. " At Al Anon I was told that alcoholism was a disease like Alzheimers...no it is not. This website should be taken down immediately, what an absolute crock, alcoholism is a choice, nobody is forcing alcoholics to drink, a disease...ha, a disease is something that is completely out of your control. Al and Sapphire, saying that alcoholism is a disease is NOT an excuse - it doesn't justify our actions, and we do have to take responsibility for them. Neither is it a way of saying it's okay because it's not our fault - it might not be our fault, but we are able to control it once we realise what we suffer with. And as for the idea that Al came up with that it can't be a disease because you don't become an alcoholic by touching one,well you don't get cancer by touching a cancer victim, would you say that isn't a disease either? Sapphire, try finding an Alanon meeting - they are a group for relatives and friends of alcoholics, they will be able to help you. AA is the best way in fact the only way ive been able to stop my drinking.Ive tryed most things over the yrs and no doctors understand,my last resort was AA and 5yrs later im still sober.You need to be at your rock bottom and want it.Id lost everything including my sanity.No more destruction and remorsefulness worry about what others are thinking and disappointing my family . It's NOT an excuse its Recovery!! Dear Al, AA is all for holding people accountable for their actions. Almost to a fault i would say, as there is no blaming others in AA. This can make a person feel incredibly guilty initially but I believe it is an important step in recovery, to look at your part in your resentments which is done in the 4th step instead of blaming others or using the "It was the alcohol not me!" excuse. If you haven't realized that a huge part of AA is in fact holding yourself accountable for your actions then you haven't been paying attention. In our society diabetes and heart disease are viewed as diseases even though the causes of those diseases are 50% genetic and 50% due to poor lifestyle choices that were in the individuals control. You can view alcoholism in the same way. My son has been an alcoholic for at least 10 years now, this has overtook our lives. these past years. 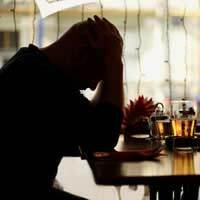 my husband and I are at our wits'end, my son admits that he has a drink problem and has some help. he also has attended a few AA, meetings, but bcause we dont understand why he has a drink problem, this causes the family to pull away rather than to pull together as we find this dificult to comprihend,during the yearsof this my husband and i have split up, many times more so these past 5 years or so.we are trying to understand why he feels the need to drink himself into a stumer confuses me, ive came on the net to find out more about this addiction.and i agree with the comment above if You label this a disease. you are givingan excuse to lable them selfs,, to feel free that its ok to be an alcoholic, when you are living withone. being our son, it is so difficult to understand why hes continuing to do this to himself, is there somewhere we could go and learn how to deal with this.please can you help. we are at our wits end.. Thank you for taking the time to read this.. I disagree, even as a regular AA user. AA likes to refer to alcoholism as a disease. I think this just gives the alcoholic the excuse that it 'wasn't their fault' that they started drinking and just passes their responsibility to the booze, instead of them taking responsibility for their own drinking habit!if you think of a 'real' disease, like cancer, the individual has absolutely no control over the cancer at all, whereas an individual who drinks alcoholically does have a choice and can repair themselves, with the right help and support. diseases are also said to spread. how can alcoholism spread?? If I touch an alcoholic, will I start to abuse alcohol? of course not! yes, I am a recovering alcoholic, but no, I refuse to accept this, frankly, crazy, excuse that alcoholism is some kind of 'disease'! It is an addiction. Is gambling a disease? No! Is drug abuse a 'disease'? No! addiction Yes!